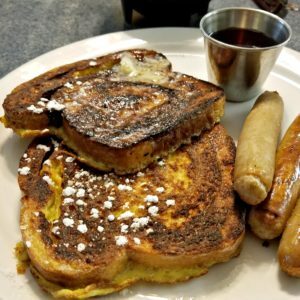 Looking for a great breakfast joint, some unusual specials, or classic meals full of flavor? 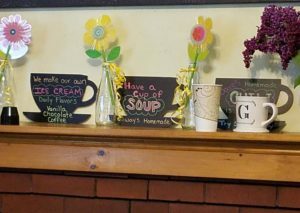 Then check out Parson’s Corner Restaurant in Barton. This breakfast/lunch spot if right at the four corners in Barton, across from the Congregational Church. It was once the parsonage, hence the name, and that history is apparent in the restaurant. The dining area takes up what were once 2 rooms on the main floor of the building. The walls curve to the ceiling, lots of windows let in lights and allow for a nice cross breeze on beautiful Vermont days, and the doorways connecting the two main rooms all lend to a homey feeling. Local artwork and pictures adorn the walls. A large Jelly Cupboard takes center stage in one dining room, while the second room features a larger traditional dining table. The kitchen area is open with a large L-shaped counter. Many people prefer counter dining and there is plenty of space here. This room looks like it was once the main room of the home, with a large fireplace as the focal point. An alcove also allows for a large table that is almost like private dining and can accommodate a large family. We are not big breakfast eaters, but this is one of our top three breakfast places in the NEK. 1. Dave (the chef/owner) has the best sausage and gravy I have had in the Kingdom! I am a huge fan of his lunches as well. Hearty meals, sandwiches that feature fresh meats not just deli slices, and incredible soups. I ordered the cinnamon French toast on special. My husband ordered biscuits and sausage gravy, which came with a side of eggs and home fries. 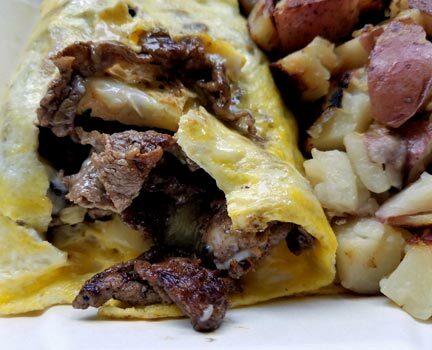 And we got a steak and cheese omelet to bring home to our son. Let’s start with the biscuits and gravy. First there is no skimping on sausage here. The thick gravy is full of meat. It is also full of flavor. This is not packaged gravy that turns your biscuit to mush. 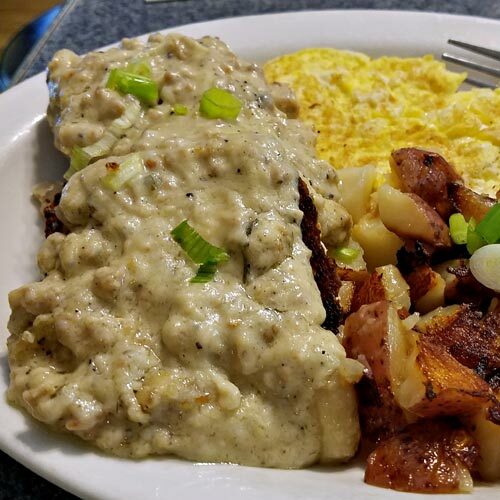 It sticks to your fork and with browned biscuits underneath you get a hearty bite throughout the meal. There is also a bit of bite in the flavor. This is one of the few restaurants that doesn’t skimp on the seasoning. This meal comes with home fries which are nice and crispy. And the eggs are served to order so over easy, scrambled, over hard…It’s your choice. I was surprised by the French toast. Made from Cinnamon swirl bread, each bite was a burst of flavor. And served with Vermont Maple Syrup (of course) I finished the two pieces in record time. This special came with a side of meat – link sausages, bacon, or ham. In an uncharacteristic error, I received sausage instead of the bacon I ordered. But the staff remedied this without an issue. The bacon that was brought to me was not dripping with grease or overcooked. I enjoyed the chewy pieces that seemed to have less fat than I have experienced elsewhere. Whether this was coincidence or the brand being used – I don’t know. The omelet we ordered to go was ready when we were ready to leave. And it was hot. Again there was no skimping on ingredients here. A large amount of home fries filled half the container, and the three egg omelet was oozing meat and cheese. While it was no match for a teenage boy’s appetite, I don’t think my husband or I would have been able to finish it. Overall, Parson’s Corner is one of those places that you have to try if you’re in the area. There is a special feel to the building and the people that work there – you feel like family. The food is flavorful and hearty, and the portions are large. 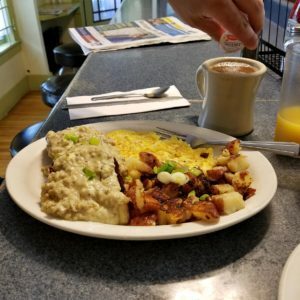 It is always busy and regulars call each other by name, share the daily paper up and down the counter, and banter with the ladies behind the counter – and with the chef himself. 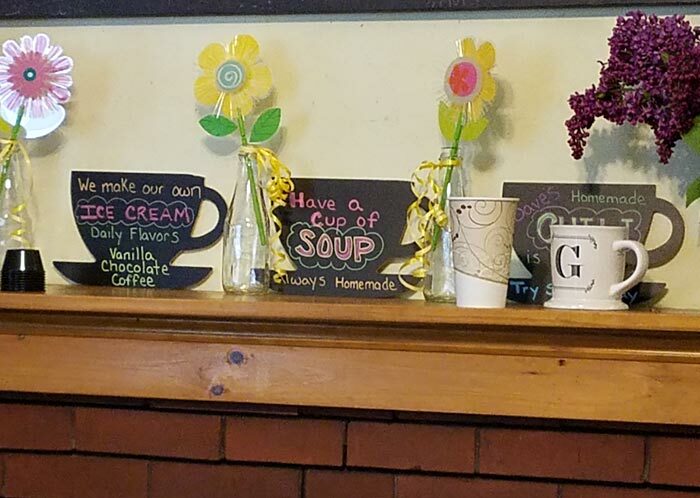 Boasting inventive items, homemade ice cream, Vermont Coffee Company coffee, and a number of quality ingredients really lends to the over feel that the owner cares about his customers – and that is something that stands out about Parson’s Corner.